The main reason I got into hunting for parallels to IPA over six years ago was Pete Brown’s excellent book Hops and Glory. I liked it so much that I posted a review in four parts. It seemed to me that if beer was being shipped to India it should have been shipped across the Atlantic Ocean as well. And as it turned out my hunch was correct. It shouldn’t have needed to be a hunch, of course. This all should have been well researched but, as I have droned on about, there has been a tendency in beer writing to skip the whole research thing and rush to observation. So, we have wallowed in myth. In this post, like the one on how beer was commonly not pale and not smoke-laced before the use of coke for malting, let’s just summarize what is known so that we don’t ever have to slip back into the land of fibs where it takes the latter 1800s popularization of lager to invent the concept of the know-how and practice shipping of US beer over long distances to lucrative markets. => First, Taunton ale. As we have known for a few years, Taunton ale was imported in large quantities into New York City since at least the 1750s when newpaper notices for the stuff start appearing. It was brought to NY in the first two decades of the 1800s. It was certainly also in Jamaica in the later 1700s. We do not know how much of it was imported into other colonial communities solely because no one has researched the question as far as I know. => Next, Hibberts Brown Stout. This stuff is all over the place. Click on that thumbnail. That is a notice from just one store in 1805 stating that they have fifty-five casks on hand with another 498 casks on route. British beer brought in and in bulk. Broadly. Nova Scotia. Texas. Lots of folk were importing. They knew how to put a cask on a ship. => And then, porter. As I recently wrote, it “was enjoyed in New York City as an import and then a local product in the second half of the 1700s, before and after the Revolution. The best was “ripe and brisk.” A brewery built in the 1760s by a Hudson River dock was known as the porter brewery for half a century. It shipped to both the East and West Indies. Again, masses of the stuff being shipped in and shipped out. => There’s New Haven ale, too. Worthy of its own post, New Haven, Connecticut ale appears in Albany (of all places) in 1802 in an ad that also have NYC ale coming north, too. There was an agency in NYC and some sort of Federalist plot related to the 1803 burning of the brewery. The brewery had enough barley for 1500 barrels of ale when it was destroyed. Scale. => Plus, there’s southern beer. You see it in the logs. Click on the ad. Brewing was not practical below a certain latitude so brewers like William Faulkner of NYC and Albany shipped to South Carolina… and the West Indies. He died in 1792. Not to mention there was northern beer, too, three decades later. I haven’t even figured out what that was. Except it was shipped in bulk and was intended for trade. => And, of course, there’s the entire history of Albany ale in the first half of the 1800s. Enjoyed from Newfoundland to Hawaii. Brewed at a scale that rivaled anything in Europe by mid-century and for decades after that. Why wouldn’t US brewed beer and ale be shipped in mass quantities well before the rise of lager? Ship’s beer is a core product. Ship + brewing = wealth. Just like they knew how to make pale ale without smoke fouling, the English knew how to load a ship full of beer for an expedition to the Arctic in 1577, for God’s sake. The Hanseatic League was shipping beer internationally before 1400. Why? Money! Just as with big craft today, every brewery owner has always known that getting past the local market is where the real money is. It’s the goal. The goose that lays the golden egg. When the great American lager breweries begin shipping by rail in the later 1800s they are just building upon centuries of bulk beer shipment under wind and sail. Albany may have been a leader but it was not unique. The more that actual brewing trade research is undertaken the more clearly this will be set out. Guaranteed. I was looking up spruce beer to see how late it was being advertised and came across a small batch of notices from one newspaper in Schenectady New York in the 1830s. By the second half of the 1800s, there are plenty of recipe books that offer homemakers the ability to make a 1.5% alcohol soft(ish) drink for the family based on sugar and essence of lemon. Unlike those household guides, the 1830s lemon beer appears to take its place with other alcoholic beers and not in the temperance drinks cabinet. The notice of the lost notebook to the right is particularly interesting. from the 28 March 1832 edition of the Schenectady Cabinet, it explains its own purpose – but whoever was keeping track of the debts of this drinker was serving lemon beer along with rum and beer. Or porter, sweet wine, strong beer and New Jersey cider. Premium drinks. Yet, the recipe for ginger beer to the lower right is from 2 May 1818 of Albany Gazette and that looks a heck of a lot like the later 1.5% temperance drinks. Maybe the stuff was both premium and light, a small nod to sensible drinking in the fairly debauched days of James Monroe. I found the passage below in the 1969 book Rogers Rangers: The First Green Berets by Burt Garfield Loescher. Like you, I was spending my Thursday looking for spruce beer references. The book covers the span of the Rangers operations in the French and Indian War against New France and then later during the American Revolution from April 1758 to December 1783. This passage at page 106 describes two beer related scenes in the summer of 1760 as British and Anglo-American local forces are in camp at Crown Point, New York making preparations to move on Quebec to the north. On June 17, Captain Brewer “piloted” Captain Jenks of the Provincials with 200 men across the Lake to a Spruce grove that he had previously discovered. Brewer and his detachment of Rangers instructed Jenks’ 200 Provincials in the Rangers’ method of march, thus making the expedition serve a dual purpose – to protect their march to obtain Spruce for Beer, and to make them more effective fighting force for the campaign. Brewer and Jenks returned laden with Spruce, and without meeting any scalping parties. I have a thing for Major Robert Rogers who lived from 1731 to 1795. Despite remaining loyal to the Crown, he is rightly credited with being the founder of the US Army’s Rangers. “Rogers’ Standing Orders” are still used and his unit is the namesake of the New York Rangers. After Quebec falls, he passes though my town in the autumn of 1760 on something of a commando mission to alert the back country that the English are in charge. I have an annotated copy of Major Robert’s journal. Nerd. There is more information in the journal on the sutler indecent. A “sutler” was a non-military food and drink vendor that followed an army which, as we mentioned in Ontario Beer, often set up in tents. They were basically small mobile taverns. So, having the civilian booze shack attached to your unit get out of line was pretty embarrassing – especially in the lead up to battle. The order of 3 July was broader that just the sutlers in question. All sutlers and market people are desired to take notice that they will be served in the same way or worse if they are found to make soldiers drunk or do anything else contrary to orders. Interestingly, Roger’s Rangers were soon ordered to be in charge of piling wood at the edge of camp all day and keeping it burning all night as sentries. That’ll keep you out of the sutler’s tent and away from the rum, wine and strong beer. The spruce hunting expedition of 17 June is also pretty cool. Roger’s unit was out on patrol at the time, returning on the 21st with twenty-six prisoners. The less experienced troops who go off for the spruce are gathering the boughs for a healthier sort of beer that was brewed within the camp under orders. In 2008, I posted about the order of General Amherst that details out how it was made. Seven pounds of spruce to three gallons of molasses. Sending 200 soldiers out to gather boughs must have meant they were getting in maybe a few tons. Laden they were. Spruce beer continues to have its fans well after the wars. Medcef Eden was brewing it in 1785 in what is now the Financial District of Manhattan. The last reference I can find is in a new report of a tavern brawl in 1885, like something you’d expect in a sutler’s tent. I’ve been trying to figure out how to catch up notes on some of the larger New York breweries* in the 1790s and early years of the new modern nineteenth century. It’s a time of transition and not just in the sense of the changing of the guard. The post-war political and economic confusion was well on its way to leveling out. One factor that was helping were the Napoleonic Wars and Europe’s continuing disruptions. There was a market for grain on the continent and Britain had a bigger enemy to deal with. Still, there was also a changing of the guard. Even though many of the big brewing interests in both Albany and NYC backed the winners, they did not stay in brewing for very many decades after peace broke out. Among many things, one interesting aspect for me is how repetitive the pattern is in the beer industry. Beer is an easy entry trade that, when done well, eventually offers wealth and perhaps even political power. As we see today in the big craft sell off, it can take time but what doesn’t? Folk with the myopic interest in whatever the PR guy or craft brewery owner is handing out as a story may not notice but brewing is a great way to shift one’s economic class upwards. A business for the ambitious to enter then later leave. Perhaps a summary post will help illustrate what is arguably happening at the turn of the nineteenth century and how similar it might seem to today. Think of it just like a weekly bullet point round up but for a period of time lasting just about the best part of a decade about two centuries ago. First, let’s consider the Eden brewery of Gold Street in NYC. Last November, I posted about the brewery of Medcef Eden** on Gold Street just off Maiden Lane. When last we met George Appleby had taken over the place in 1791. Medcef is too prosperous to bother running the place himself. The brewery is located opposite the First Baptist Church on the corner of John and Gold, a bit of a highland location. Appleby is still there in October 1792 brewing his ship’s beer and spruce beer even though he is no longer on the waterfront. On 16 November 1795, right below the report on the price of pork, the Albany Gazette reported the death of George Appleby, remembering his years with former partner Mr. Matlack. In the 19 October 1797 edition of the New York Gazette Eden is selling off his kettles as well as hair cloth, used to moderate the malting and kilning process. The sale is secondary to his reward for the return of “stolen” slaves. Not runaways. Stolen. Medcef Eden Sr. dies in September 1798 and leaves his estate to three executors: Joseph Eden, Medcef Eden Jr and Martha Eden. The site of the brewery was also done by 1802. A notice in the New York Daily Advertiser from 27 March of that year – as shown under that thumbnail – indicated the site had been formerly occupied as a brewery but would take a some level of conversion to revert back to that use. The kids ain’t interested. And arguments over the will, due to the later huge value of his accumulated Manhattan lands, go on for decades. I suspect you will see this sort of thing when hold out craft like Stone gets into the next generation of ownership. The Brooklyn Ferry Brewery tells a different story. One of grit, determination and successive failure. Almost insistent failure. In January, I wrote about the brewery at Brooklyn Ferry from the mid-1760s to 1795. At that point, the lands and wharf which had been built up by Isaac Horsfield and his sons were being leased out by one Cary Ludlow. The actual brewery was described as Mr. Sing’s. A tenant. Maybe a sub-tenant. In the Christmas Day 1795 edition of the New York Gazette placed R.W Maddock and Co. as brewers on site with cellars for their ale and beer being kept in lower Manhattan. Just fourteen months later in February 1797, the partnership with Mr. William Sing and another behind the “Co.” dissolves and early that summer, Roger Worthington Maddock is selling off the remainder of the term of his lease and all his equipment. The curse of Brooklyn Ferry continues. Ludlow gives notice of the opportunity to buy the brewery and associated lands again in 1801 as well as in 1803, shown above, with a great description of the range of facilities on the site: brewery, malt house, milk house, kiln, wharf as well as a water pump to supply ships at dock. Still, it was cursed. Lesson? The brewery, the brewery owner and the brewers are very different classes of thing. Pay attention today to how many craft “brewers” never did the actual work of brewing. The end of the era of Lispenard’s famous brewery on the Hudson displays how the right combination of Eden’s wealth accumulation and Brooklyn’s parade of brewers can catapult descendants into decades of idle wealth. Last month, I showed how the Rutgers clan through most of the 1700s controlled a four brewery conglomerate stretching across Manhattan from what is now Tribeca south across Maiden Lane and over to Corlear’s Hook served by two farms and water from two drainage systems as well as the natural creek for which Maiden Lane is named. I lost steam at the end. In October, I wrote about the Lispenards and they married into the Rutgers dynasty when Leonard met Elsie. Their son, Anthony Lispenard, takes over the operations of the Greenwich Street brewery on the Hudson River at the foot of what becomes Canal Street. He marries well. Sarah Barclay is related to the brewing Barclays of London, England. I brought the family forward to the fire of 1804 and past it when their fortunes were made on the lands that, as we see so often, the brewing wealth allowed them to obtain but more detail can be added. In 1794, the brewery is described as brewing ale as well as table and spruce beer and Marston has joined Lispenard – Leonard Lispenard, son of Anthony. Three years later, Marston has the place up for sale even though it is occupied by a Mr. Wilson. Another two later in 1799, the brewery is up for sale again and again it is being sold by Thomas Marston. It is described as being in the rear of Trinity Church*** and “lately tenanted by H. Wilson.” It covers two lots on Greenwich and two on Lumber Streets. In March 1803, it is up for sale and described as being the brewery of Anthony, the father, despite the son Leonard being brought into the firm in 1794. John S. Moore occupies the brewery at the time of the December 1804 fire. As I showed last fall, the tide of wealth catapulted those that followed into high society throughout the 1800s. And then there was Henry Rutgers. Rutgers, you will recall, is the second or third cousin of the Lispenard controlling the Hudson River brewery as the 1800s dawn, depending on whether it is father Anthony or son Leonard we are talking about Lispenard-wise. He is a classic great American who leaves the fortune which founds Rutgers University in New Jersey. I sketched the story in February but let’s fill in a bit more. As you can see from the thumbnail, Henry was moving on from running the brewery as early as January 1793. In 1795, he is elected to the hospital board, sits on a committee considering an international treaty and has diversified commercial interests. In late 1796, he chairs a Congressional nomination meeting. By 1799, he is a leading partner in the purchase and sale of the Watkins and Flint tract. The wealth generated over generations of brewing has made him one of the richest men in the young United States. That’s his family’s house up there well before this point. It was where he lived until 1830. Likely no one has ever moved from brewing to billions and power quite like this one man. I’d be interested in thoughts of anyone comparable. One New York brewery seems to try to buck the trend in the period 1795 to 1803. Unlike the various forms of end-of-brewing we see with Rutgers, Eden, Lispenard and even the brewery that couldn’t die in Brooklyn Ferry, the brewery that started as an 1760s plaything for George Har(r)ison, spoiled son of Francis the high placed colonial lackey of the Crown. After George dies in 1773 and the Revolution comes and goes, the brewery is in the hands of grandson, Richard. Richard reinvents himself as an ardent Republican and, like the others, leases out his brewery in the 1784 to Samuel Atlee who does not last even into 1788. The brewery itself, however, has at least one more life to live. In 1790, it is in the hands of a new partnership – Robertson, Barren and Co. It doesn’t last. Click that thumbnail. By 1792, the brewery is in the hands of Fred and Phil Rhinelander who, by 1795, who are (delightfully) selling gin alongside ale and porter. Six and a half years later, operations at the brewery change hands again as John Noble and Co. announced in the 10 December 1801 edition of the Mercantile Advertiser that they have taken the extensive brewery lately occupied by Messers Rhinelanders in Greenwich Street.” It is one of the more exciting beer notices from the era as it claims they “have been long accustomed to prepare” porter for the East and West Indies. Porter produced for export. The notice is titled “Porter Brewery.” It lasts, again, just a few years. Noble’s entire stock is sold off at an auction by his creditors in April 1805. Interestingly, the Rhinelanders’ other business kept going – including the importation of spices – until Frederick passed away. After that the lands start to be sold off at the same time city government decides to clean up this part of the Hudson shoreline. Their sugar house, however, lasts until 1968. Things pass. The landmark that was Widow Rutgers’ burnt brewery of Maiden Lane is not the only end of these things. Eden, the Brooklyn Ferry brewery, cousins Rutgers and Lispenard as well as Harrison’s plaything are all gone. The backbone of the entire City’s brewing for at least the last half century pack it in by the middle of the first decade of the 1800s. It is not just that the good water is disappearing. The scions of the generation are as well. Plus, they have made their millions and the community needs their lands anyway to house the flood of new immigrants coming to make this the greatest city on the earth in the history of humankind. Arguably. In 1790, there are 33,000 people in New York City. In 1810, there are almost three times that. There is simply no place – no space – for the big dynastic brewers who dominated the southern tip of Manhattan, including some whose families had been there for most of the previous two centuries. *Soon, the small brewers of 1795 to 1805. **Last Saturday, fellow traveler beer historian Gerry Lorenz at the Shmaltz taproom in Clinton Park, NY made a good point after we realized we were pronouncing many of these brewers names differently. He is of the opinion that what I was pronouncing as “Med-seff” was actually “Met-calf” as in Metcalf, Ontario. Could be but I now need to explore the name as a Yorkshire artifact of the 1700s to make sure. ***That’s the first Trinity Church. Not just Albany. Delmar, too. Delmar! Land of Craig’s youth. We sat at Real McCoy with owner and sign maker Mike Bellini and his pal Jay, a pro ciderman. I like a one-person brewery. Ron said it was the set up he dreamed of for himself. He was preaching the double brown gospel. Research. Comparing notes. Overly precious hipster nano failure v. single hop and malt explorations. The height of barley stalks and why. Maybe. Local hops were passed around. Forgot to mention the spruce beer idea, that coniferous flavouring predates DIPAs in the repetior. Everywhere we go Canadian malt is the backbone of NY craft brewing. Good to see. It’s good to be helpful. Definitely some sort of brown ale revival going on. And local ciders everywhere. 2014’s fruit salad obsession may just be history. Wouldn’t that be nice. Yesterday, Gerry L. was with us for a couple of hours and was corroborating and filling in gaps in 1700s NYC. And backdating schenck and lager. Was it just a new word layered on existing practice before the Panic of 1837? Maybe. More nerdism this evening. Trains, canals and marketplace expectations. You don’t advertise in a paper to the neghbourhood customers. Not in the 1790s. No way. Standing in the mid-1790s looking forward in time, I have a sense of things changing in the history of New York brewing. I am a bit concerned that in a few years I will be facing a confusing mass of information coming at me too soon, from too many directions. Still, for now as the frontier just begins to fill there are stories which are manageable. We certainly understand the situation in Albany and in New York City itself at 1790 where long standing families still controlled the market as they have for generations. Soon these dynasties will be outnumbered as new immigrants arrive, some close up sensing change. Others struggle with the coming grim reality. As the frontier lands begin to be populated and repopulated in the first decade after the American Revolution new breweries open in new towns. We have seen breweries opening to the northeast of Albany in Galway and Stillwater in the 1790s. There is one more in Kingston advertising in January 1795 and another posting a notice in Troy the next month. We have seen how beer shows up in the last years of the decade in western New York related to the colonization coming up from Baltimore along the Susquehanna which flows to the south. And in 1795, a brewery opened in Cooperstown. It did not last as first envisaged. By April 1797, George splits town and partner, Walter, dissolves the partnership based on the defection as you can see from the notice at the right up there. It probably was not entirely Walter’s fault. In 1795 the district had a booming grain growing economy feeding into the European market ravaged by the Napoleonic wars. By 1797, the Hessian fly was ravaging crops here as it was elsewhere. And there was the Panic of 1796-97. Plus, as Taylor explains, by the summer of 1796 Cooper as Federalist patriarch is facing a younger generation of more republican men of merit who defeated Cooper in his bid for a seat in Congress. It split the community. Perhaps George Mulcock picked the wrong side. Plus a local wave of anti-Masonry bigotry broke out, too, in response to the new lodge. Maybe he was a Mason. William Morgan appears to have met a bit of a weird end. In 1827, the Governor of New York wrote the Lieutenant Governor of Upper Canada to state that Morgan had been kidnapped and taken across the international border. A reward was offered of $200 just to for information on his whereabouts. If that in fact is the same Morgan, the man of fifty stories and rabid anti-Mason. WILLIAM MEAD, M.D. was born October 15, 1747 in Greenwich, CT, and died February 01, 1829 in Galway, Saratoga Co, NY, buried in Charlton, NY. He married (1) PHEBE FARRANT. She was born Abt. 1750, and died October 21, 1776. He married (2) GEERTRUYD MYNDERTSE Abt. 1779 in Schenectady, NY. Notes for WILLIAM MEAD, M.D. : Revolutionary War Surgeon, 1st New York Regiment. WILLIAM MEAD was born January 08, 1748/49 in Nine Partners, Dutchess Co, NY, and died February 27, 1838 in Hector, Tompkins Co, NY. He married HANNAH PALMER 1778 in Stillwater, Albany Co [now Saratoga], NY, daughter of ELIAS PALMER. She was born September 13, 1760 in Norwalk, CT, NY, and died Aft.July 28, 1840 in Hector, Tompkins Co, NY. Notes for WILLIAM MEAD: William kept a tavern in Stillwater, NY, where he had moved two years after the Revolutionary War. He served at the rank of Colonel during the Revolutionary War. Now that looks more promising. Here is a sheriff’s notice from 1790 showing William owning that tavern in Stillwater in 1790. Here is another from 1792 – see who the sheriff was? Peter Gansevoort – of the brewing Gansevoorts. And notice in the ad up there to the left that the brewery could do a 13 barrel brewing session? That is not a tiny operation. That is about the same size as the smaller kettle at the Brooklyn Brewery prior to the Revolution. It’s in the same ball field as Vassar’s first brewing set up in 1808. So, it’s a fairly generous operation for the time. Heck, it’s almost twice the size of Greg Noonan’s micro in Vermont. Notice also that he moves into the area from the south, his wife from Connecticut. A lot of the folk in the genealogy appear to do that. So, just as we see folk moving up the Susquehanna from the Mid-Atlantic to colonize the central Southern Tier in the first half of the 1790s there are others from New England moving into the area around Albany in the later 1780s. Likely moving into Loyalist farms, already cleared land. And brewing their beer. 1799 was a bad year for NY brewers. Or at least a year in transition. The tail end of a recession. The Catherine Street spruce beer brewery is for sale. The once mighty Greenwich brewery of the Lispenards? Up for sale. Groshon’s place is up for sale, too. Yet there are the first want ads for folk wanting to hire brewers. Even coopers. Flux? Hessian fly? Click on the thumbnail. The Hessian fly is certainly hammering the fields. What about the other guy. John Mead, the brewer. Crap. One thousand, one hundred and eighty references to men named John in the genealogy of the Mead folk. This may take some time. What a title. I have been trying to figure out how to move out of the cities of Albany and New York and figure out what is going on in the young state’s countryside after the American Revolution. As with today, a variety of factors cause how beer is and is not available. And a variety of factors which affect why Albany remains the center of brewing in New York for the next two or three generations. As always, it is not just about the great white male even if there are plenty around to take credit and, yes, to have some effect. To understand what happens as a matter of individual personal will, however, is to miss much of history. First, we need to consider a map. This is a detail of the 1796 map by John Reid showing western New York. It’s really large scale. Have a look around. Notice something? Not a lot of roads. Not a lot of towns. Not a lot of people even 13 years after the end of the Revolution. There are reasons for this. It was difficult to settle. There were treaties with the aboriginal population of the remaining Iroquois to settle. And there were residual colonial rights of the state of Massachusetts to play out as well. Beer needs people and, for the most part, beer drinking people were not there yet. Hence the road from Fort Schuyler, on the Mohawk River, to Genesee, from being, in the month of June, 1797, little better than an Indian path, was so far improved, that a stage started from Fort Schuyler on the 30th of September, and arrived at the hotel in Geneva, in the afternoon of the third day, with four passengers. This line of road having been established by law, not less than fifty families settled on it in the space of four months after it was opened. It now bids fair to be, in a few years, one continued settlement from Fort Schuyler to the Genesee River. All last winter two stages, one of them a mail stage, ran from Geneva and Canadarqua to Albany weekly. A wilderness changed, in so few years, to the comfortable residence of a numerous body of industrious people, who enjoy the comforts and conveniences of life in a degree superior to most parts of the United States, affords matter of curiosity to the intelligent traveller, and many respectable characters undertake the journey from no other motive. To them, therefore, it must be highly gratifying to find entertainment and accommodation equal to any thing of the kind in America. Very few places of the size now exceed Geneva, either as to the stile of the buildings, the beauty of the adjoining country, or valuable improvements. The number of sail-boats have greatly increased on the lake, and the sloop finds constant employment : and, in addition to their comforts, a person from Scotland has established, at Geneva, a very respectable brewery, which promises to destroy in the neighbourhood, the baneful use of spirituous liquors. The apple and peach orchards, left by the Indians, yield every year abundance of fruit, for the use of the inhabitants, besides making considerable cyder; so much so, that one farmer near Geneva sold cyder, this year, to the amount of one thousand two hundred dollars. See that? One thousand two hundred bucks from cider? A fortune! And see that other thing? 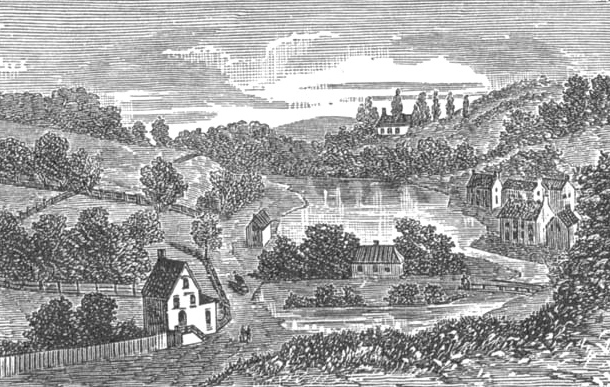 A brewery in 1797 in Geneva, New York. Half way between what is now Syracuse and Rochester. That’s the log cabin brewery that Lord Selkirk came across in 1803 and recorded in detail in his diary. Clear title to land and a road established by law. Things the true pioneer lack. The settlement at Geneva had another advantage. An early route to the sea. Before the road reached it, early Geneva sat on the lake. And the lake reached south. Have a look at the map again. Find Geneva and trace a line south. See the bottom of Seneca Lake? Look left a bit. See Mud Lake? See that branch of the Conhocton River reaching over to the north and east. Before the roads were there to move goods on land there was a route to get people and goods in and out that reached south. To the mighty Susquehanna and on to Baltimore. Click on that thimbnail. It’s an entry in the diary of John Maude from 23 July 1800. It describes a scene in a haying field near the Conhocton River, wild enough that its infested with rattlesnakes but settled enough that the locals are handy in dealing with them. And there is beer. Is that the route it took up there in red? The colonization of the Conhocton was a big effort that centered on a new town, Bath. It sought to create an estate in the old world style and it was based on the idea that a proper community needed a number of resources including beer. You may have noticed that there is no great city there today. The idea did not work out as planned. Bath never became more than a village and the surrounding area never became another Hudson Valley. But it does illustrate the way in which the civilization of beer first came to the frontier lands of New York, bringing the promise “to destroy in the neighbourhood, the baneful use of spirituous liquors.” Peace, population, law and investment. All preconditions to the establishment of a beer culture. This is just a high level introduction. I am going to dig into New York state brewing in the 1790s, conclude the state of New York city brewing to the end of the 18th century and establish another foundation for the ascendancy of Albany in the first half of the 1800s. That will require looking at the Dutch estate properties, slavery, another early colonization effort at Cooperstown as well as the hovering menace of the British to the north. Piece of cake. Done by March. Easy peasy. So, last October I posted about the location of Rutgers’ 1700s brewery in New York that seems to have ended its days in a fire in the 1780s – and then went off looking at other stuff from the same era related to other families and other breweries. But I got to wondering about when that Rutgers brewery was built and came across a dense essay on the family’s genealogy that just about answered every question I could imagine asking about them. So, once again, I am up at 5:30 am instead of snoozing for another two hours to see if I can get all this out of my head. The essay is located in that best seller from 1886 called The New York Genealogical and Biographical Record, Volumes 17-18 published, neatly enough, for the New York Genealogical and Biographical Society. The particular article in that journal is named “The Rutgers Family of New York” and it was written by Ernest H. Crosby. Without getting into the story of the Society itself, it’s interesting to note that the sister of the last wealthy brewing Rutger married into Crosby folk, one of whom, Enoch, was a Revolutionary spy for the unLoyalist side who became the basis for a novel by James Fenimore Cooper. I know this because there is an other article in the same book entitled “Geneological Sketch of the Family of Enoch Crosby” but enough about that. Let’s look at the Rutgers. Some highlights for starters and then, maybe over the weekend, I am going to keep adding more detail as I go along. I know. That’s not professional. It’ll be messy. I hear you. Bear with me. 1. Five generations of the family from the 1640s to 1830 were wealthy brewers who converted their resulting wealth into land ownership and political power. 2. They are slave owners – something not much mentioned with New York. Notice the reference in the lower left of the 1639 Vingboons map of Manhattan to the “Quartier van de Swartz & Comp de Slaven.” Here’s a very searchable reprint from 1670 to play with. 3. Before the Revolution they had at least four separate breweries concurrently being operated by fourth generation siblings and cousins. 4. They also operated two farms in downtown Manhattan that supplied their breweries with their own grain and which were likely worked by slaves. I have seen 18,000 booted around as the figure for the population of New York City around 1760. By 1790, there are over 33,000 residents of the City. By 1830, there are over 202,000 living there. Good to keep those figures in mind as we go through this. Also, keep in mind the ugly diagram from this blog post from last weekend which gives a sense of the urban expansion during those years. The first brewery operated by the Rutgers dynasty was located on Stone Street in very downtown Manhattan by the second generation’s only male, Harman Rutgers, who moved from Albany in 1693 bringing his sons, Harman and Anthony. The street corner where it was located is still there, Stone Street and Whitehall. Click on the pale coloured thumbnail. The original name for Stone Street in the Dutch era was “Brouwer Straet” or Brewers’ Street. Gregg Smith in Beer in America: The Early Years 1587-1840 identifies this brewery but confuses the location saying it is “located on the north side of Stone Street near Nassau.” Nassau did not extend south of Wall Street at the time. The Rutgers were not the first to brew at the site. They bought an existing brewery operated by the family of the late Isaac de Forest. De Forest had immigrated to the New World with the father of Harman Rutgers (1st) in 1636. It had been operated since the 1650s relied on a well that was apparently still there in 1886. The insanely detailed Costello Plan of New York City from 1660 shows the location as well. Drawn as a bird’s eye view with every building set out, you can clearly see the intersection of Stone Street and Whitehall on this 1916 reprint. Click on the other thumbnail. Isaac Bobin was the Private Secretary of Hon. George Clarke, Secretary of the Province of New York. So clearly Rutgers was as good as second to Albany stale for high society… or at least their workers. And in any case – we do not know if it was from Anthony’s brewery or Harman’s. Not a lot of detail. Unfortunately, the 2014 book Manhattan in Maps 1527-2014 states at page 40 that there were basically no maps drawn from 1695 to Bradford’s in 1730-31. Drag. We will have to leave it at that for now for Anthony’s brewery. Except for this irritatingly detailed but undated reference in a letter, the PPS referencing this brewery for someone needing to find a nearby residence, meaning it is a known landmark. Oh – and in the notice in the New York Gazette from 3 July 1769 confirming the brewery was in operation as late as that date. That’s in the thumbnail up there. Cart and Horse street is described, as “leading to Rutgers’s brewhouse,” that is, from Maiden Lane to the present John street, and is now part of Gold street. The brewhouse was burnt on the memorable 25th of November, 1783, in the evening of the day the English troops embarked and left the city to Americans. The blue green thumbnail is really interesting. It is a detail from the fabulous Viele map of New York and shows the original land mass, the original boggy lands as well as the area of landfill into the East River as of 1865. It also shows the topography. Now notice on the brown thumbnail, a further detail from the 1776 Hinton map, how Rutgers managed the drainage of the bog that extended the farthest inland. There is a grim, dark aspect to the Rutgers fortunes. The overall system is a vertically integration operation. The estates supply the grain which feed the breweries which create the profits to buy the lands. But the lands were worked by slaves. That large text thumbnail is a notice placed in the 9 June 1760 edition of the New York Mercury. It’s particularly grim when you compare it to this notice in the New York Journal 9 January 1772 about a stray horse. The other thumbnail shows how the brewery was used in the Revolutionary War for the storage of war supplies. The issue of slavery was brought to the forefront in the war. The ad to the left is from April 1770 while the one to the right is from March 1779. They describe Faulkner operating out of three breweries: the one at Brookland/Brooklyn Ferry, next to the Rutgers’ brewery on Maiden Lane and then on to the one at Mount Hope. In May 1768, brewing was a “new undertaking” to Faulkner. But in fairly short order, though either desperation or the entrepreneurial spirit, he is on the move. The Brookland Ferry brewery seems to have been a loser. Brewer after brewer have a go at running it from the 1760s to at least the 1790s. They each move on or quit. The Rutgers brewery on Maiden Lane seems to have a bit of a chequered career, too. As did the spruce beer brewery at Catherine Street. In the end, Faulkner leaves the lower end of the Hudson Valley altogether and ends his career in Albany by 1790. There certainly could be a number of factors behind Faulkner’s moves but I am going to suggest that the search for clean water is one of them. One thing you notice from the maps and diagrams of Brooklyn Ferry of the time is that the area where the first buildings are located it just north of a high area, now Brooklyn Heights. Which hints there might have been originally a stream or creek along the path of the curving main street. After the area is built up, that stream would have been overwhelmed and would have lost its usefulness. Once that happens, the brewery finds itself sitting next to sea water with difficult access to water. A similar story plays out more clearly with Rutger’s brewery. It’s located on Maiden Lane which, like at Brooklyn Ferry, is still visibly subject to road design decisions made hundreds of years ago. It was also a good address in 1790. Click on the thumbnail. That is a diagram of the Great Fire of 1776. I have shown Maiden Lane in green and Gold Street in yellow. They twist a bit. They still do today, 240 years later. Because they are based on watercourses. Metcef Eden locates his brewery up a little hill directly south of a twist on Gold Street. Have a look at this detail from the fabulous 1865 Viele map of New York. Click on it. The pale blue area is the original land mass, the light brown the filling-in of the river. You can see Maiden Lane again in green, Gold Street in yellow. Not only do they twist but they move from higher ground to lower ground. It’s a watershed. You will also see that lower Manhattan was originally very hilly. And, not very too far to the north, boggy. As shown in green. And, if you look at the ugly map way up top, it’s boggy exactly where the population growth occurs from the 1780s to 1840. To understand where was are going, however, we need to take a step back. Harmenus Rutgers and his son Anthony Rutgers were very interested in water. While I think I need to go back and revisit the geneology but let’s just focus on two facts. First, in a court case, Rutgers v. Waddington, an 1784 ruling of the Mayor’s Court of New York City it states that Harmenus Rutgers bought the parcel on Maiden Lane in 1711 and started brewing at the end of that year. By 1784, the brewery is described as one of the most notable features of that part of the city. Second, in 1732 Anthony Rutgers obtained title to the swamp section of what was called the King’s Farm from the colonial government. If you look at the Bradford map of New York from 1731 or so, you see both Maiden Lane running east-west four blocks north of Wall Street and the King’s Farm to the north of that. Rutgers sets about creating a drain from the swamp which does two things. It regularizes and likely expands the waterway to the river and it formalizes what appears on maps as the Fresh Water Pond or Collect Pond. familiar with the final years of what is likely the grimmest era of New York history. What you might not know is that the Five Point’s district was located upon the filled-in Collect Pond. It takes about fifty or sixty years for the area to go from well-ordered, drained cultivated fields to bleak hell hole of humanity. And during the transition a brewery plays a central role. The house of Cadle & Stringham did a large mercantile business in this city for many years. The first of the Stringhams that I wot of, was Capt. Joseph Stringham, who commanded a vessel out of this port before the Revolutionary War, in 1774. After the war, in 1786, he settled down at 110 Smith (William) street, where I think he died. One son — I think Joseph — was a grocer in Queen street. No. 110. He was concerned with Janeway, under the firm of Stringham & Janeway, in a brewery in Magazine street (Pearl, from Centre to Broadway), as early as 1791. Magazine Street at the time was that portion of what is now Pearl Street which was immediately south of the Fresh Water Pond. In an 1848 address to the St. Nicholas Society of the City of New York, the main businesses in the 1790s in this area are listed as (i) the pottery of Crolius, (ii) the furnace of McQueen, (iii) the tanneries of Brooks and Coulthard, (iv) the brewery of Janeway, (v) the starch and hair powder manufactory of N. Smith, and (vi) the rope-walk of the Schermerhorns. George Janeway is listed in The Manual of the Corporation of the City of New York of 1862 as having been a brewer, Assistant Alderman, North Ward, 1784 to 1795 and Alderman, Sixth Ward, 1803 to 1804. Issac Coulthard advertised his tannery in the New York Packet on 7 December 1787. Interestingly, around October 1794, Coulthard was involved with the sale of a distillery near the Fresh Water Pond. In the late spring of 1795 his tannery burned down – a total loss. At the end of December 1796, Clouthard has erected a new brewery near the pond and started operations with his son. Not the same brewery as Janeway’s it would appear. Was that “the distillery” being sold a few years before? Anyway, the new brewery burned, too. I think they all burned, these old breweries. In the 1 July 1797 edition of Greenleaf’s New York Journal, right, it was reported that all the malt was lost and the whole business was a write off. An errant cigar at the nearby site of the new Lutheran Church apparently started it. He gets up and operating again as by July in 1806, his beers are being advertised as being on sale at the Porter and Punch-House of Henry Gird in Brooklyn. But he soon suffers a series of personal losses. His son dies in February 1807, his daughter-in-law dies in October 1810 and his daughter dies two months later – the latter two both of lingering illnesses. The visitations all are held on Cross Street, the heart of what becomes Five Points. And on 29 January 1812, the death of Isaac Coulthard himself is announced in the New York Gazette. The funeral procession started at Cross Street. …in 1805 or thereabouts, the city constructed a canal intended to drain the Collect into the Hudson and East Rivers. The canal soon also began to stink, and it was eventually moved underground as a sewer. Its former path was widened to become Canal Street. When this plan didn’t work as intended, city officials elected to raze bucolic Bunker Hill in 1811 and use the earth to fill in the pond to create housing for the growing population. As with any venture, marketing is important. The neighborhood that arose in this spot was named Paradise Square. Unfortunately, the land never fully settled. It was marshy, and mosquito-ridden, prone to flooding, and when buildings in the area began to sink—and the area began to smell—in the 1820s, the remaining wealthy residents fled the once desirable address. Immigrants and African Americans, seeking low cost housing as it was all they were able to afford, filled the area. By the 1830s, the neighborhood had settled into the Five Points, sporting a reputation as a dirty and dangerous place, which would thrive into the 20th century. ++++++++++++Well, that was sordid. Next, I need to find out who else is brewing in New York from 1790 to 1840 and whether they had a bit better luck than the folk who lived around the Fresh Water Pond.